Handbill advertising a march in support of the Equal Rights Amendment (ERA). The rally was held on Saturday, May 2, 1981 in Raleigh, North Carolina. The deadline for ratification of the Equal Rights Amendment was 1982; however, Congress has the power to extend that deadline. The states that have not ratified the amendment as of January 2019 are Alabama, Arizona, Arkansas, Florida, Georgia, Louisiana, Mississippi, Missouri, North Carolina, Oklahoma, South Carolina, Utah, and Virginia. This handbill shows silhouettes of people walking with their arms around each other. Beneath the image is a quote from Susan B. Anthony, "There will never be another season of silence until women have the same rights as men have on this green earth." Those participating in the "rally in Raleigh" will be making a statement of E.R.A. support in North Carolina and other states. They will be delivering the message that "The dream still lives. The hope will never die." “Shoulder to Shoulder. 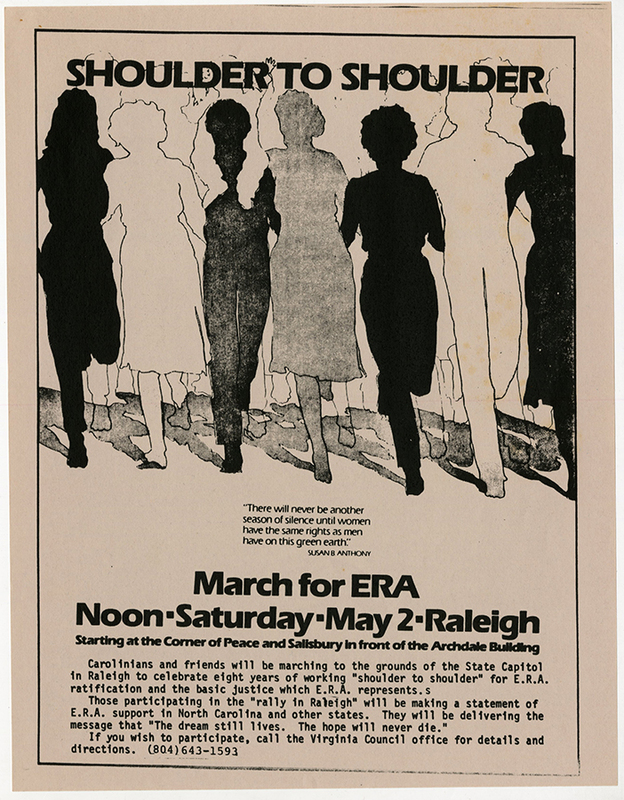 March for ERA [handbill],” Social Welfare History Image Portal, accessed April 24, 2019, https://images.socialwelfare.library.vcu.edu/items/show/414.